To travel is to be between one place and another. 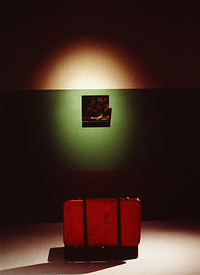 In this installation “being between” is investigated in relationship to cultural baggage, in particular nationalism. The larger spheres of politics and territorialization are explored vis-à-vis daily life and the personal desire for home and comfort. In “Travelers”, suitcases act as agents carrying a variety of narratives (films) through an un-named interstitial space. 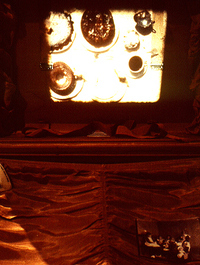 A series of loop films are projected into the suitcases, creating cinemas for combat and domestic narratives alike. The projection sounds (helicopter or machine-gun-like), grainy home-movie format, and ambiguous space, are disorienting as much as they are tied into the narratives, allowing the viewer to take part in the act of being displaced. The abstract landscape, in bands of camouflage colors, wraps around the space, until the colors break into evenly sized bands—evocative of a flag—and then disintegrates into landscape format again.